Choosing cars to spotlight is tricky business, and at a show where most of the cars have already been in HOT ROD Magazine the difficulty increases exponentially. 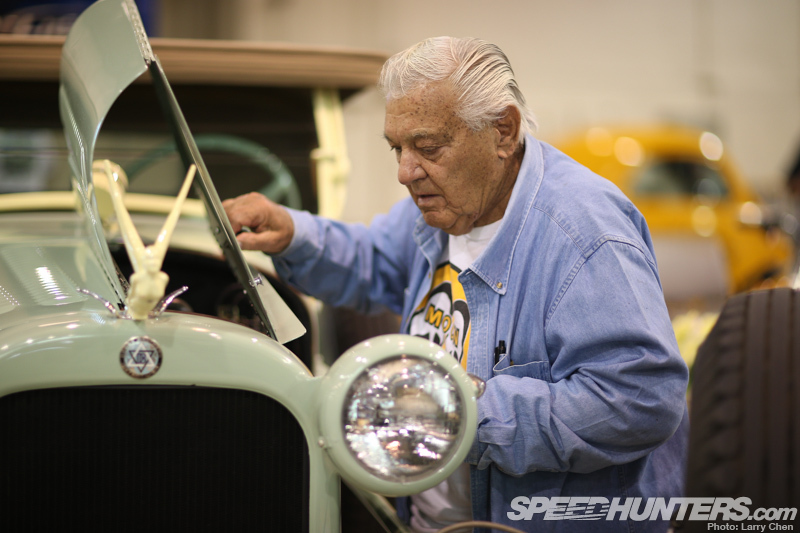 There were just so many good cars at the HOT ROD Homecoming that picking out the ones we wanted to show was tough. For that reason I started outside, where none of the cars had yet been featured in HOT ROD’s pages. 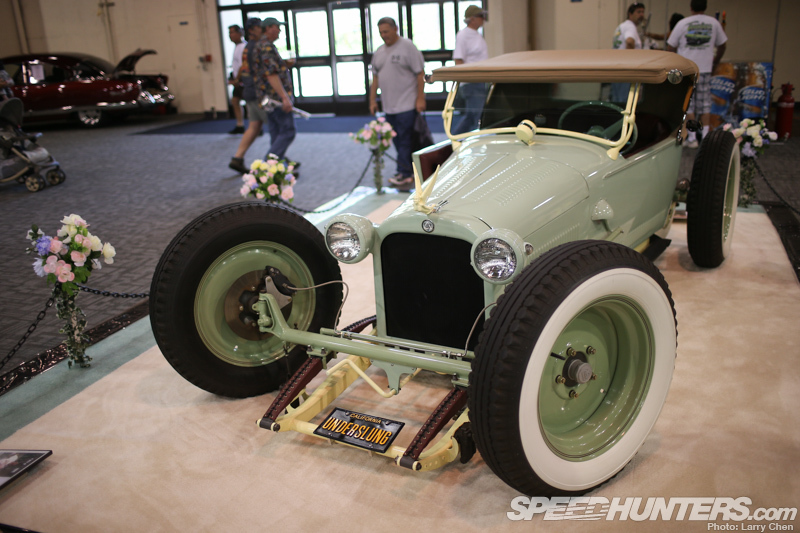 Enter Robert Ruiz’s ’27 Phaeton, mounted to a smoothed-out Model A chassis. I’ve said it before about different cars, but this is a body style I usually don’t like. 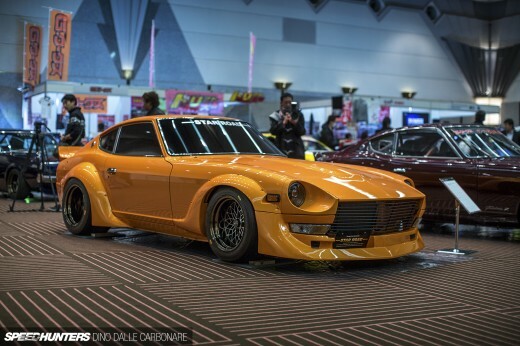 This car is proof that anything can be cool if you build it right. Everything has been shaved on the tub-shaped body to form one solid shape. Color choice has been limited to green/white/chrome and it works well. Following the ‘simple is better’ theme, Robert transplanted an instrument panel from a 1960 Rambler over a chromed piece of perforated steel sheet. Engine-mounted gauges supplement those on the dash. That’s the back of a GMC 6-71 blower you see through the windshield. 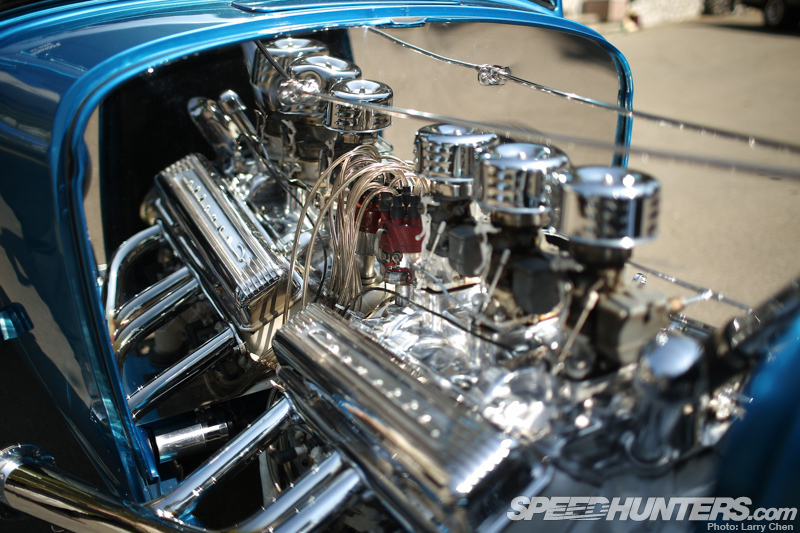 Under the supercharger is a 392 cubic-inch Hemi that’s been chromed and polished. 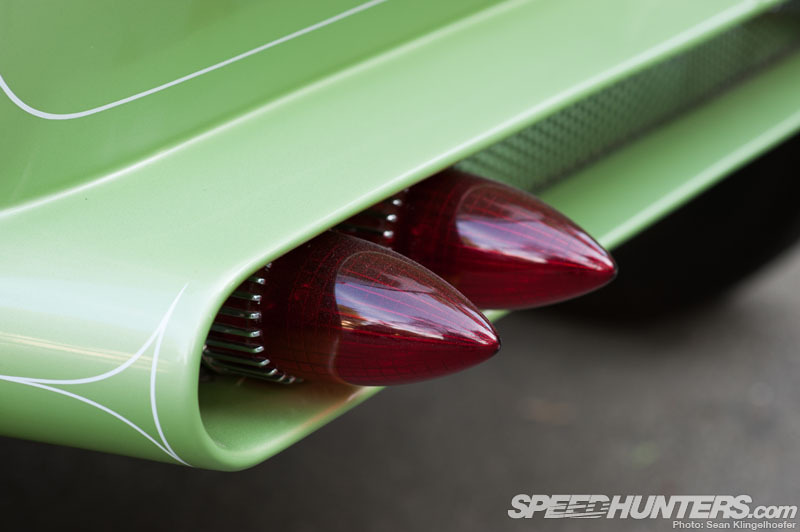 Robert hand-formed the rear panel to house ’59 Caddy lights and inset matching perforated sheet to tie in with the dash. 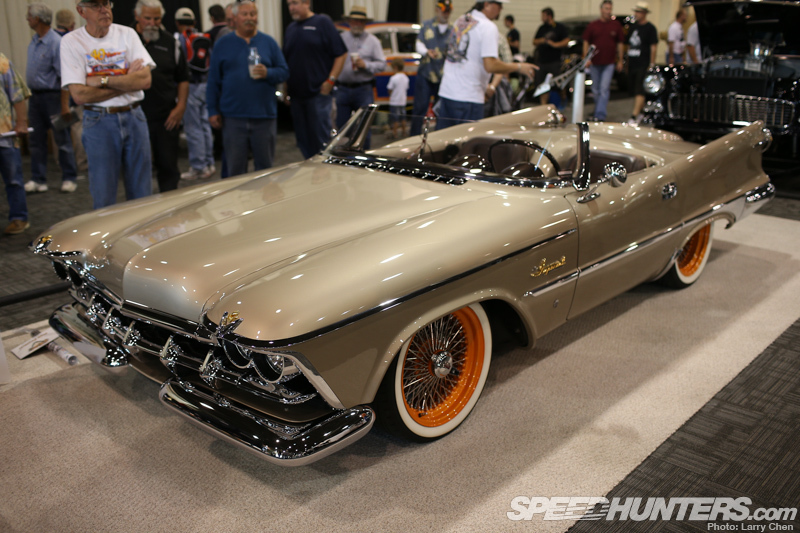 HOT ROD announced at the show that they will be featuring the Phaeton soon, so keep an eye on the magazine for a full feature. We don’t make a habit of taking pictures of posters on the floor, but you have to study this image for a minute. This is my favorite kind of design illustration, where the artist shows you a blueprint for the car that sits before you. Everything that was removed from the body is crosshatched in red. 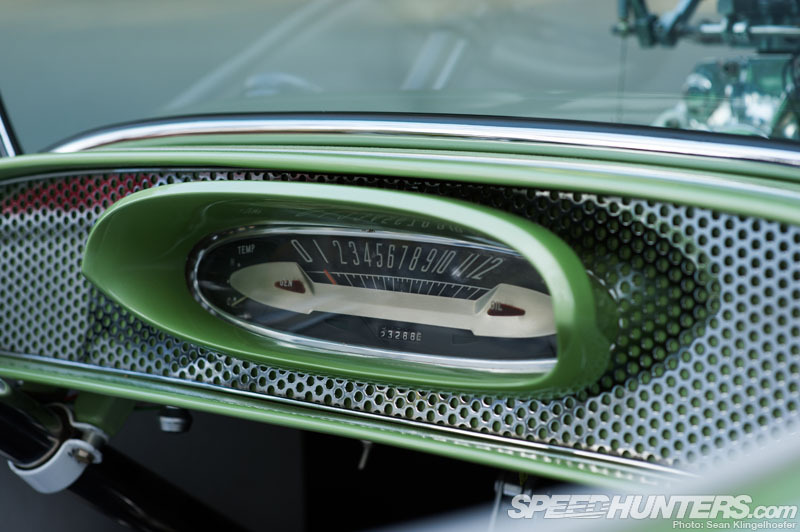 …or the stock gauge clusters that look too huge to be real. As someone who seeks zen-like proportion in everything I lay hands on, Murray’s car makes my head hurt. That’s the point though, right? The giant front tires on Underslung, a ’25 Dodge, bugged me all day until I went in for a closer look. Once I understood why the owner chose this tire size the whole build came into focus in an instant. 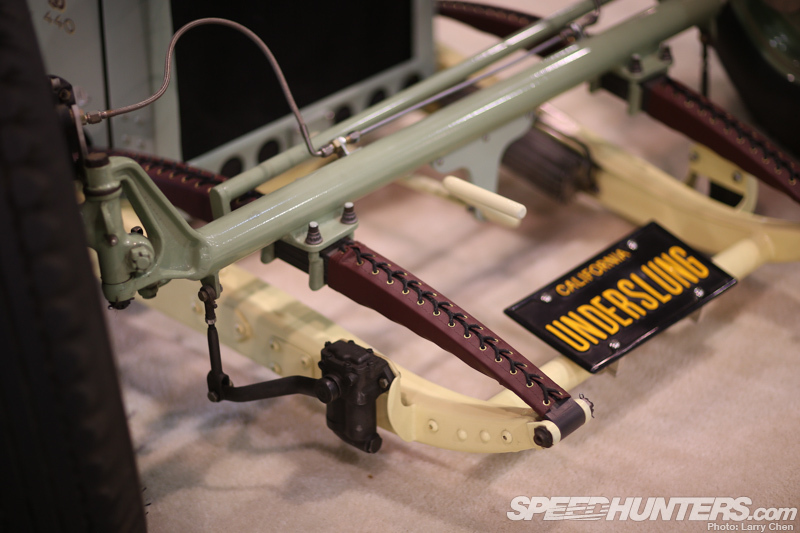 Underslung isn’t just a catchy name: the frame is literally flipped upside down with the axles mounted above instead of below the rails. Builder Joe Moreno needed those tall tires to accomplish what little ground clearance they afforded. Note the leather-wrapped springs and dual-piston, hydraulic lever shock. Joe caught us eyeballing his car and jumped out of his chair to give us a tour. He’s the kind of guy who makes you guess how he did something and puts you on the spot to make sure you’re paying attention, all with a little smirk and a twinkle in his eye. 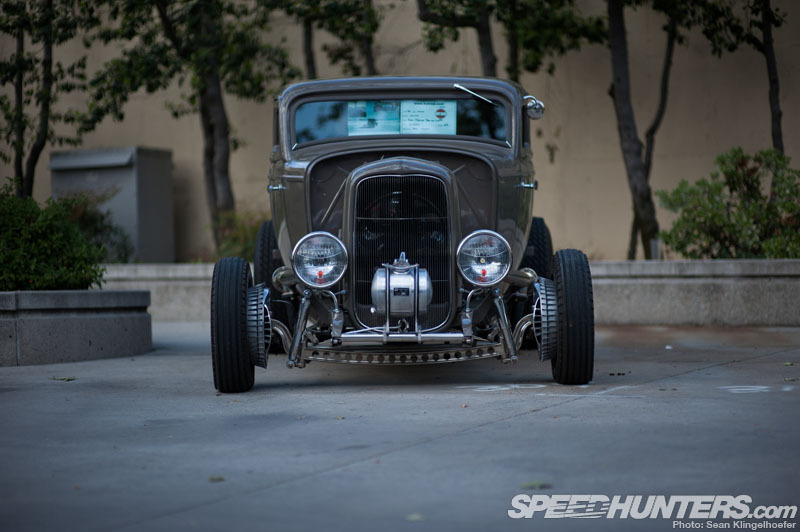 This guy is a hot rodder through and through. 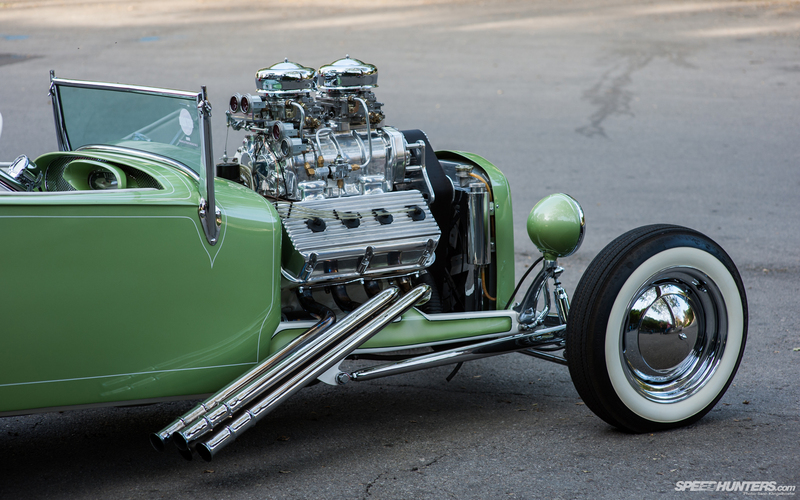 This was a budget build that took a lot of years, so almost everything you see was hand built or extensively modified from stuff he already had laying around. For example, the friction shocks he made himself, or the disk brake rotors that he had cut on a waterjet. Underslung only has one door, located on the passenger side. This is one of the items Larry and I were quizzed on. Apparently it’s hard to slide in on the driver’s side because of the steering wheel, so he just welded the door shut. 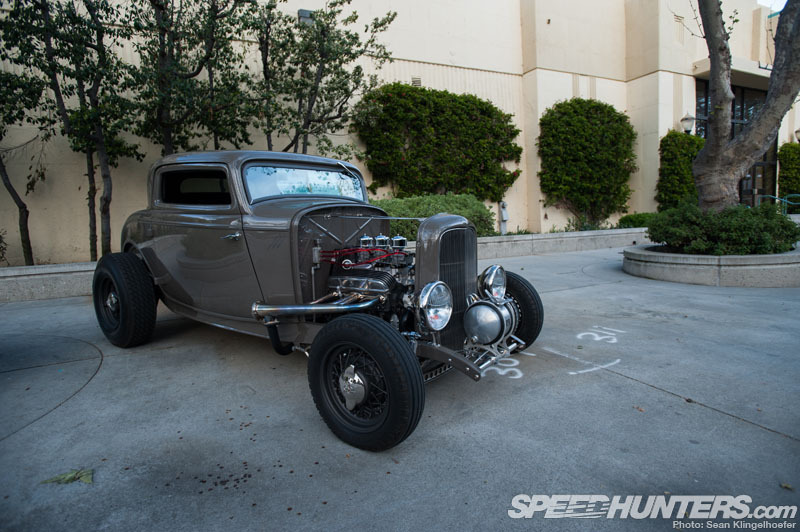 For something a little more conventional, we have Tom Leonardo’s ’32 five window coupe. This is one of those cars that I just couldn’t find anything wrong with. It was perfectly executed. He just nailed the ’60s hot rod vibe so well. 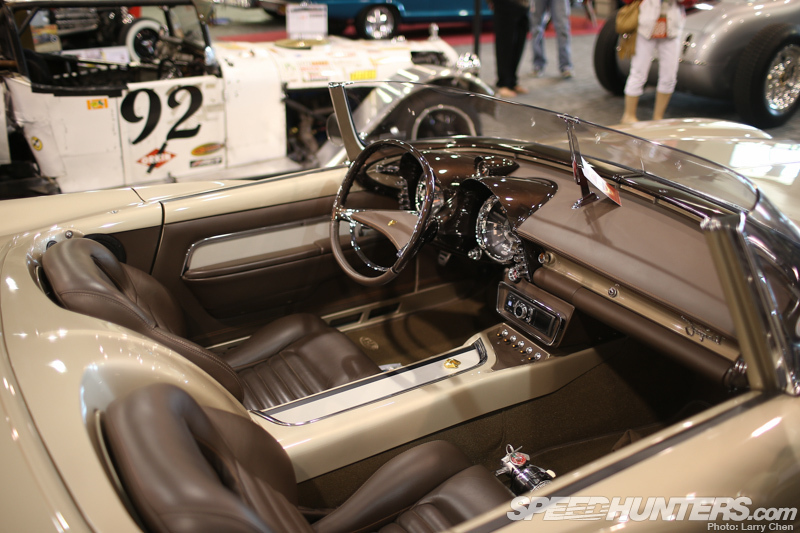 The interior was also spot-on. 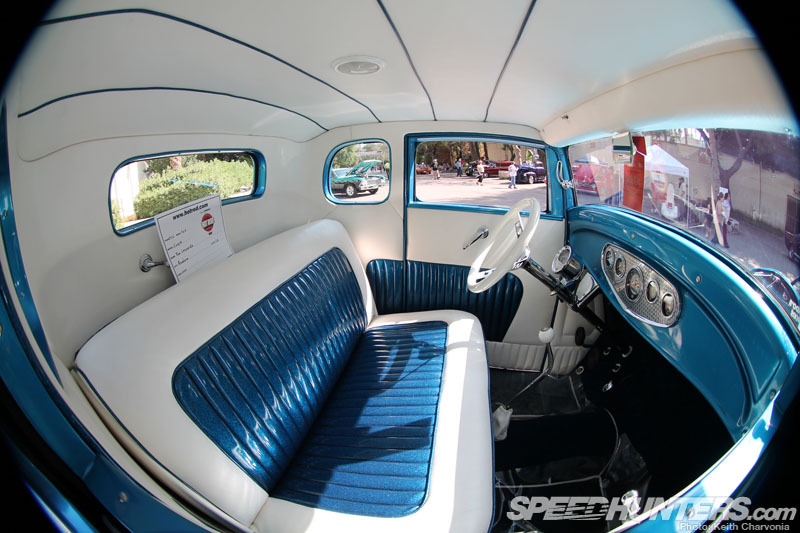 The blue metal-flake vinyl gives it a ’60s show feel without going over the top, and I dig the white steering wheel with column-mounted tach. …but I wanted to show you the Strombergs up close. 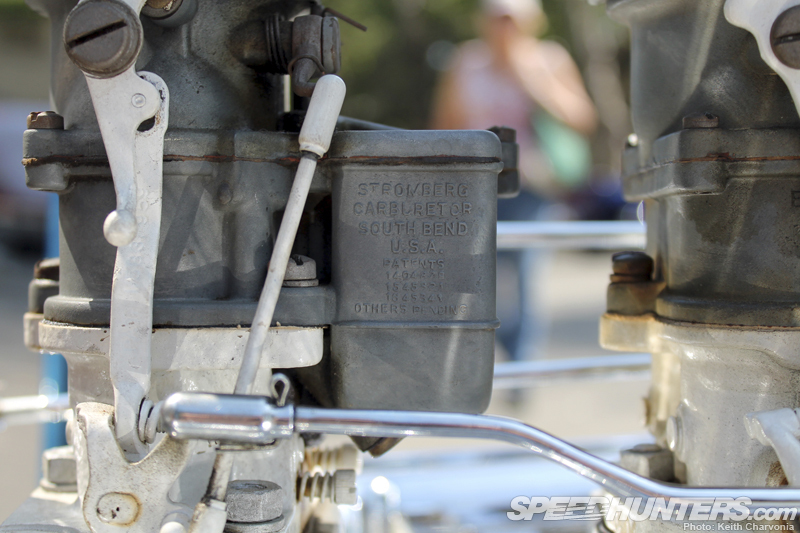 I actually appreciate the small amount of dirt on the carbs here, as it shows that the car is driven. 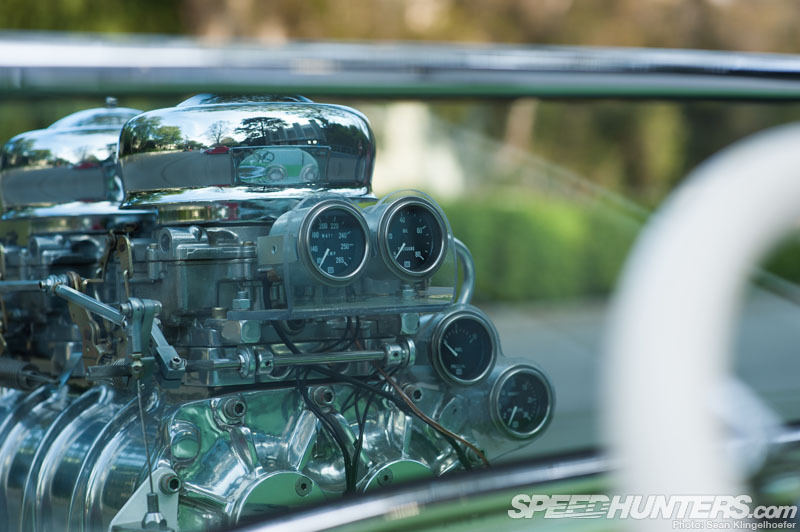 Clear plug wires, Corvette valve covers and a mirrored firewall so you can see it all twice. 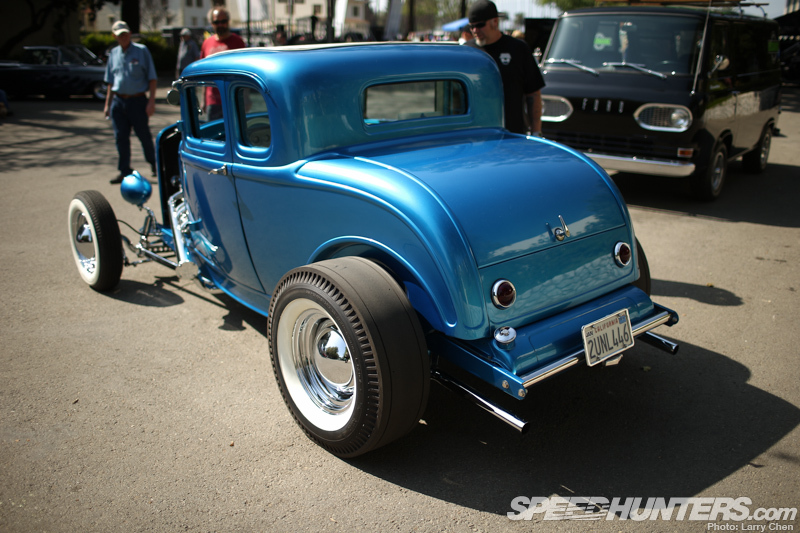 The pearl in the blue paint shows well in the sunlight and the pie crust slicks complete the perfect hot rod package. 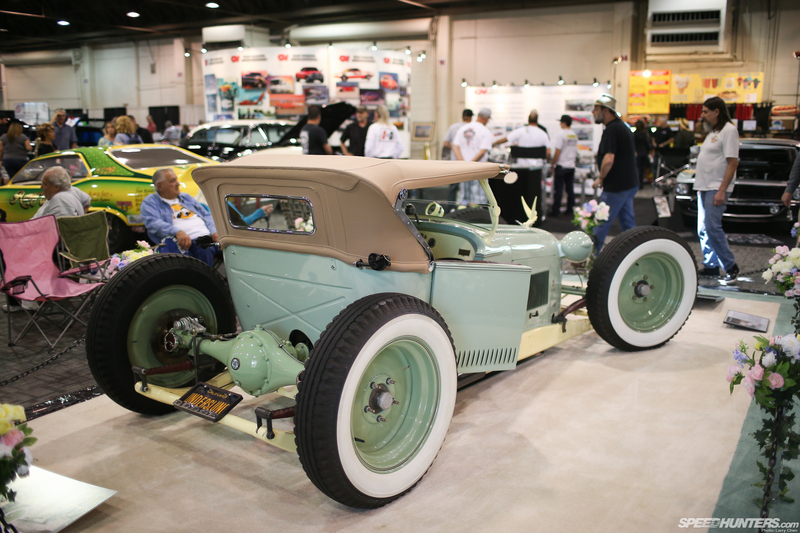 This is another car that HOT ROD chose to feature from the outdoor show. We’re doing pretty well with our picks! 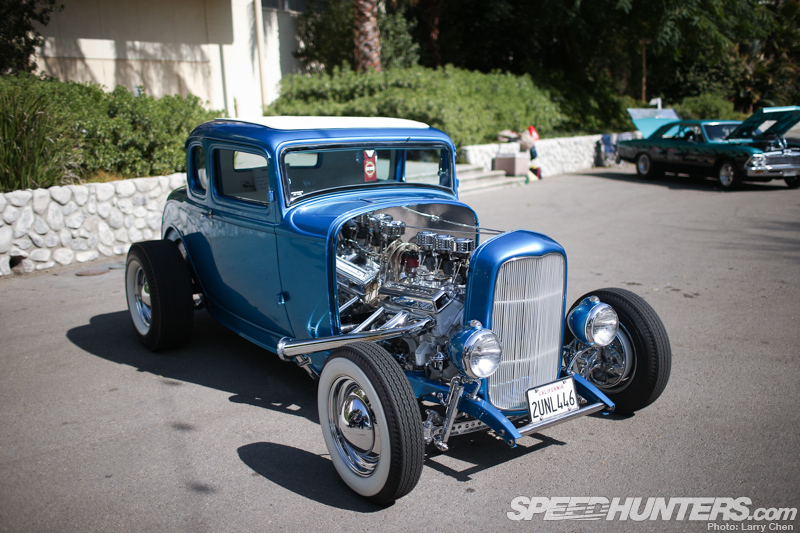 I can’t believe I’m writing this, but here’s another ’32 – this time a three-window and built in a contrasting style to the showy hot rod we just saw. These utilitarian styled builds have been gaining a lot of traction lately. Look at how tough the blackwall tires look with dark colored wire wheels. Commercial headlamps are bigger than the norm and give a cool look. A little Moon tank, dropped and drilled axle and finned Buick drum brakes are all very traditional, but the drab paint gives this combination a sinister feel. 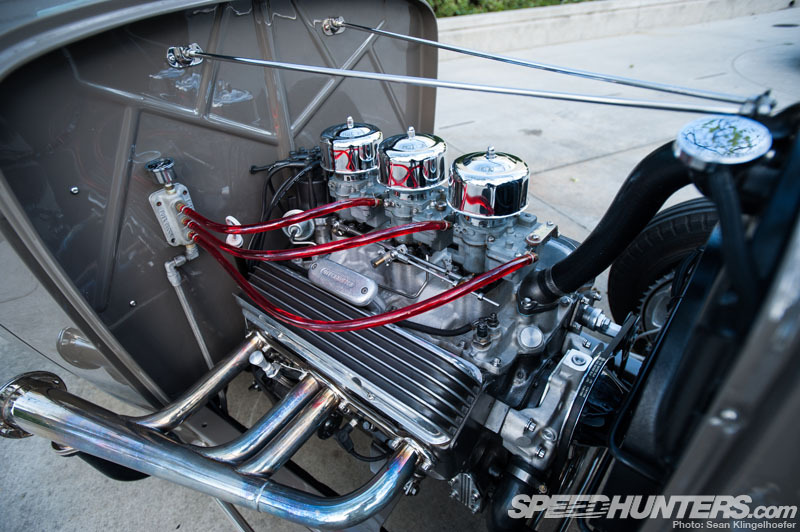 The triple-carbed 383 only looks to show-rods for a second with see-through red fuel lines. 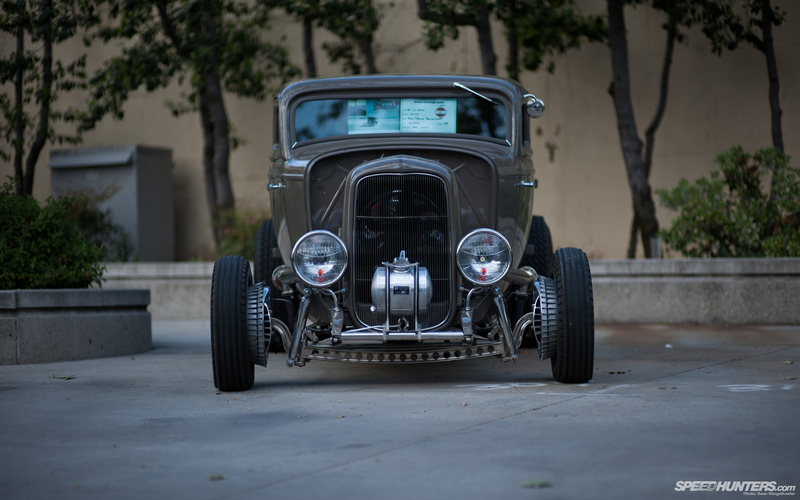 Inside we have proof that you can use exposed fasteners, holes and rivets without going the full rat-rod route. Lastly we have the Anvil ’69 Mustang, a pro build from Steve Strope’s shop Pure Vision. Under all that pure white paint lies lots of carbon fiber. Pure Vision replaced the hood, cowl, front fenders, valance, bumpers, trunk and tail light surrounds with carbon fiber. In fact, they helped Anvil R&D the parts on this very car. Instead of showing off all the carbon, they chose to tastefully reveal the material in small bits. 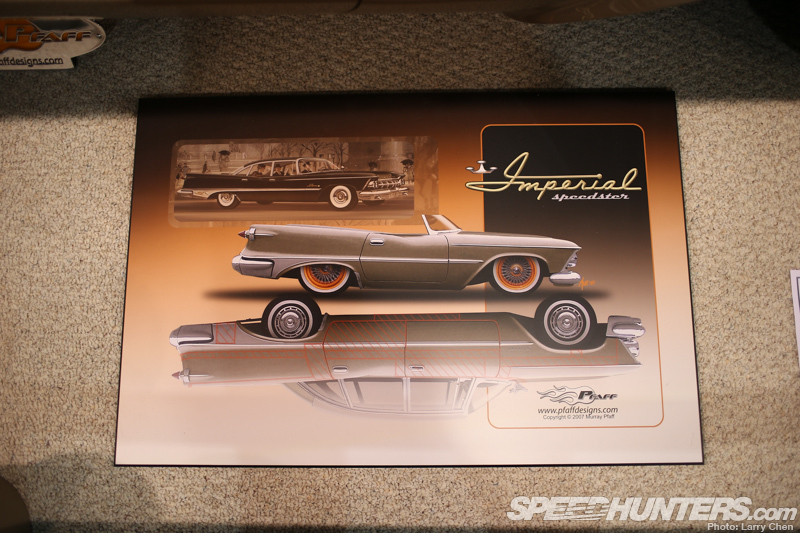 The wheels are 18″ and 19″ versions modeled after late ’60s Indy cars. 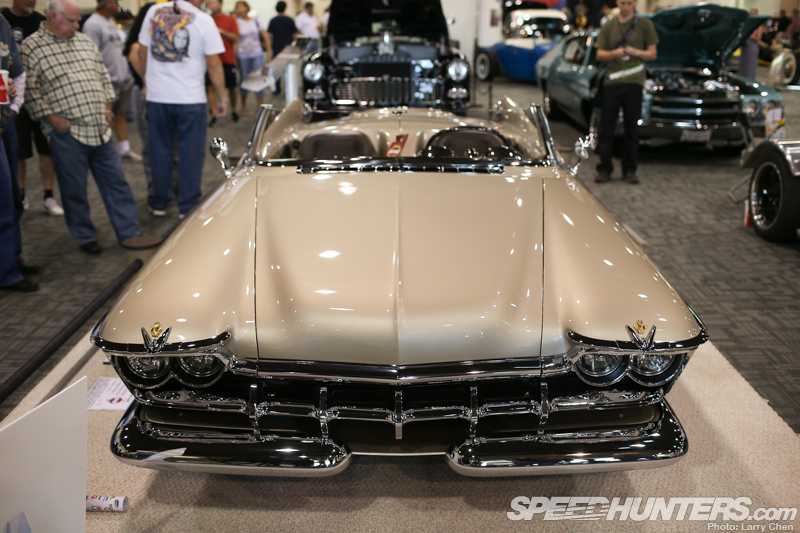 A Kaase 520ci, 850hp Boss 9 engine has been set back 3.5 inches in the chassis. 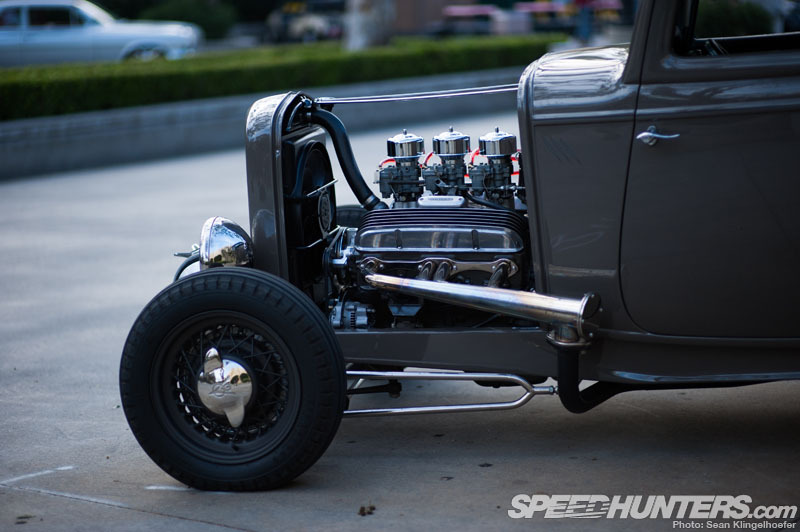 If you look closely you can spot the push-rod actuated coilover on the driver’s side. The rear suspension is also a push-rod cantilever system. Everything inside has been re-trimmed and customized with impeccable craftsmanship. 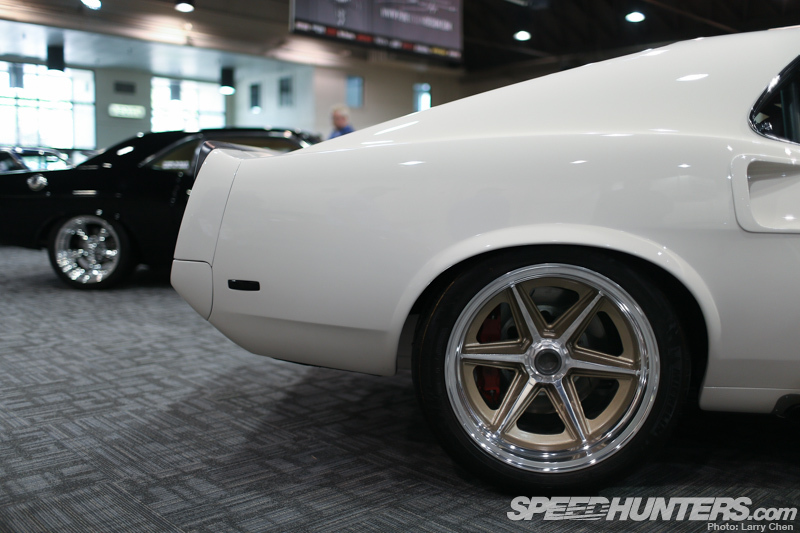 On a pro-touring build like this the car has to function every bit as beautifully as it looks. Steve spent quite a bit of time explaining all of the systems to us. 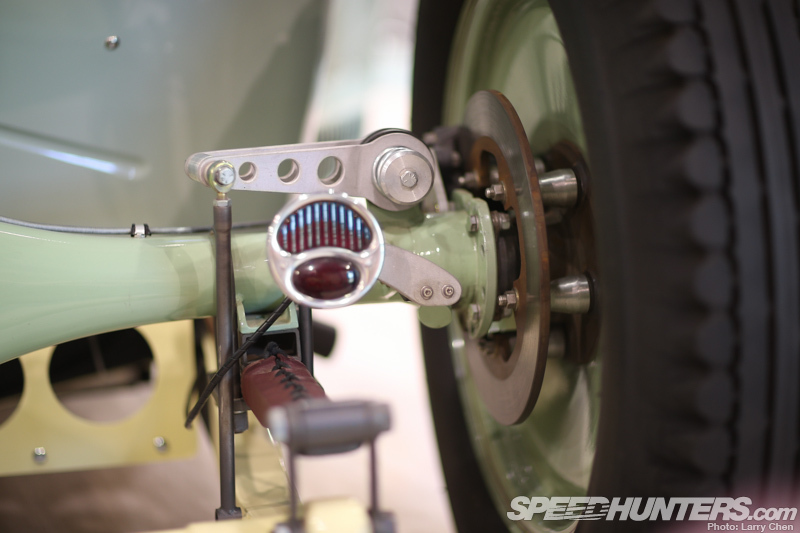 I was most impressed by the dual master cylinder brake system. 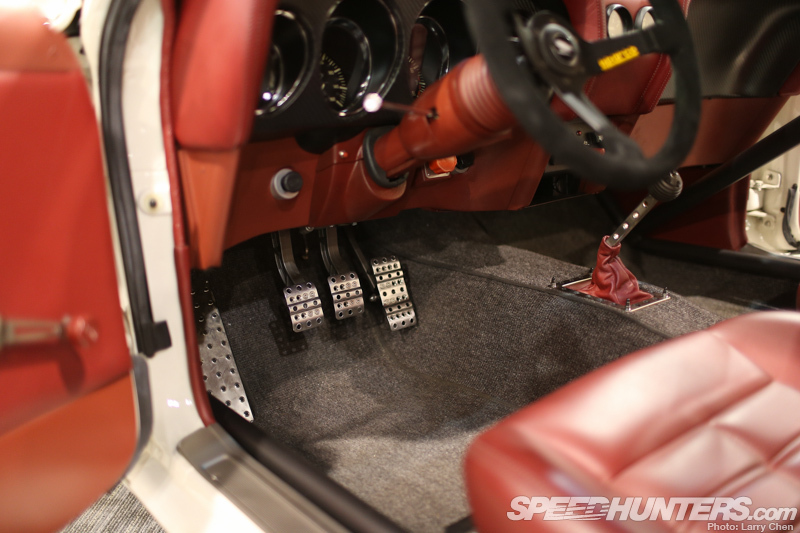 The red knob on the dash controls a rod between the pedal and the master cylinders to adjust front-to-back brake bias. There is also a separate dash-mounted proportioning valve to adjust the sensitivity of the rear brakes. As you can see pretty much every type and style of hot rod was represented at the HOT ROD Homecoming. The cars we chose to spotlight were just a tiny fraction of what was on offer.